Holy cats, what a crazy three days. I loved every minute of it. Well, almost every minute; I was just OK with sitting in the laundromat for an hour and a half. And, fellow Americans, this is a Liverpool “launderette.” Microscopic, but very clean, and the gal working there was super nice. 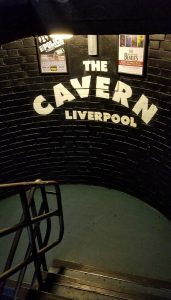 The day started with my 9:00 appointment at the Beatles Experience museum — the #1 Beatles attraction in the world, and one of the main reasons that an annual £82 million is added to Liverpool’s economy, courtesy of J/P/G/R. Speaking of money, here’s another fun (or maybe not-so-fun) fact: The Liverpool airport is named after John (Yoko gave a bunch of money for it). But Paul, who bought an entire falling-apart city block and completely refurbished the London Art Institute and accompanying school buildings and turned it into a fully functioning university, providing hundreds of jobs, and who has given countless millions to charities and restorations all over town — doesn’t even have a street named after him. Don’t you find that odd? Not that Paul was/is an angel, mind. Everyone knows he’s been a straight-up self-promoter since the age of 18. But still — John *never* returned to Liverpool after leaving it. Pretty much washed his hands of it, except for one small donation to a sculpture in the town square. Paul has remained actively involved in the machinations of his hometown all these decades — yet John gets the airport? Hmm. Anyway…the Beatles Experience was a fine one. Perhaps the best parts were the painstakingly detailed recreations, from the studio at Abbey Road, to the rooftop of Apple, to the Casbah (something I wish I’d had a chance to see this time around, as it was the very first place they played), to John’s white room at Tittenhurst where the “Imagine” video was filmed. Here are some photos. Perhaps his saddest song, expressing no belief in anything. The rooftop concert, near the end of it all. Look at the upper left corner — yikes! If you find a pair of these, I want them. After the Experience, I walked to a cafe and had shortbread and a coffee, in hopes of waiting out the 40 MPH winds so I could ride the ferry. Nothing doing. So I made my way back to the hotel, summoned an Uber, and went across town to do the laundry. When I got back, it was time for more wandering. 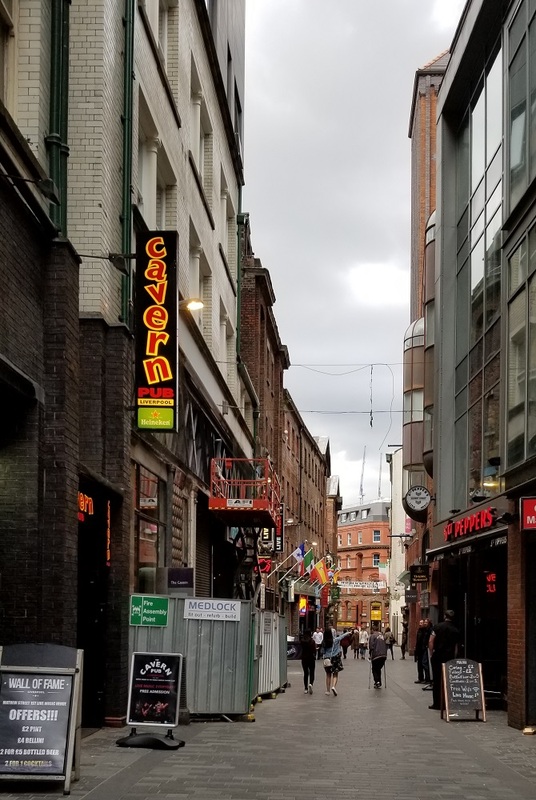 I had an early dinner at an American restaurant near my hotel (it was tasty), then came back and got dressed for the Cavern Club and the Jacaranda — two important places in the early lives of the Fabs. The Cavern is down a small alley; not at all the glittering entryway of stars. In fact, this is a perfect replica of the original Cavern, which was filled with earth in the 70s to facilitate the construction of the Merseyrail train line. However, they did use many of the original bricks in the reconstruction within the same area of the street in the 1980s. Pursuant to modern-day safety regulations, it was expanded and properly ventilated, as well as sunken a couple more levels beneath the ground (I stopped counting at five sets of steps into the club). The cool part was it was totally crowded — and not just with tourists — on this Thursday night at 7 p.m. 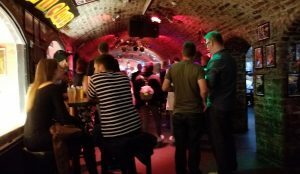 There was a live act (guitar player) who had everyone singing along, and many were in various stages of non-sobriety, enjoying themselves. It was hot down there tonight; I can only imagine what it was like back in 1961 from the stories I’ve heard and read. The condensation from the body heat alone made the walls cry, and everything was damp and smelly from burgers and BO. Can you imagine if a fire had broken out, with all those stairs to climb…insane. I walked around a bit and people-watched. It was definitely a party atmosphere. I tried to imagine this tiny place (now much bigger, with a gift shop and offices and extra seating space) when the Fabs played at lunchtime, all those years ago. Oh, to have been a part of that scene. I ended my evening with a quick stop at the Jacaranda, where the Lads would go after school, away from adults, to have coffees and cigarettes. It looked as if they were getting ready to have a lecture or poetry gathering or something in the downstairs cove, so I hightailed it out of there, but not before closing my eyes and imagining George at a corner table, joking and smoking. What a fantastic journey this has been so far. It was both a tribute to the Thriller’s memory, and an odyssey to find out more about the Beatles’ early story, in an effort to further understand why their music speaks so strongly to my soul. I’m still searching for that answer, but maybe I just need to accept it for the magical mystery it is. I hope you’ve enjoyed coming along with me; tomorrow starts a new journey to London and craziness with Suzanne! Until then…peace and love! Who are these people? They sound interesting. Loving every minute right along with you! Thanks Darice! Have you ever been to England? Have any experiences to share? Keep writing sis! Love it! You can certainly paint a “fab” picture of all you are experiencing ~ YEAH for you ~ I hope you figure out why you are so in love with the “bugs” cause I still don’t get it and didn’t get it when I was 14 in 1964 ~ Help Me Rhonda!!!! Thanks luv — and Suzanne said last night that maybe it’s best left as a magical mystery, you know? I’m cool with that. And as to why you don’t share the magic…well I can’t explain that either! I have loved every minute of your Odyssey! Having you just an hour away is also fun, almost like having you just over the back fence. Look out London, here we come!!!! I’m loving your blog posts, and so glad you’re having a great time! ? Thanks Jennifer! Real life will rear its ugly head soon enough, so I’m getting all the enjoyment I can. It’ll be nice to look back on these posts as a remembrance!